EXCELLENT!!!!! It took me a while to get through the entire collection but it was well worth the careful reading. Rita Dove is brilliant and if you haven't read any of her poetry you should. I wish I would have been assigned her poetry when I was college. It would have made for great class discussion. Actually, four and one-half (4 1/2) stars; not four (4) alone.Years ago, I read the Holy Bible cover to cover and walked away thinking that while it is the voice of God as told through humanity -- and thus, an autobiography of sorts of God Almighty written by a whole bunch of "ghost writers" or writers inhibited with the Holy Ghost -- it made for some pretty good reading. But I also felt it was an interesting autobiography in that it told of the arc of God's own spiritual and emotional maturation or "development" if you will. Not only God's spiritual and emotional maturation or "development" but humanity's spiritual and emotional maturation or "development" with God; a sort of symbiotic, yin and yang "thang". Surely some will accuse me of being somewhat sacrilegious here but what little I understand of our Maker -- and who amongst us can say they understand much of anything in the mind of God -- the concept fits when you step back and take a macrocosmic view of the Creator of the cosmos. Now, what's that got to do with this book, "Collected Poems: 1974-2004" by Rita Dove? Everything! The same thoughts oft arose while reading this one. Great poetry has many of the same traits as great religious thought. It slips me in to the mind of God.This book of "Collected Poems" is actually seven (7) of Rita Dove's books covering the bulk of her work during her earlier creative period. I say earlier because I sincerely hope this is not the end but the beginning of some of her best and most creative work. It showcases the wide-ranging diversity that earned Rita Dove a Pulitzer Prize, the position of U.S. poet laureate, a National Humanities Medal, and a National Medal of Art. The only weak spots appear in the first two (2) "chapters" or books -- "The Yellow House on the Corner" on her adolescence and "irreverent musings" in "Museum" -- nevertheless, the early creative power and genius of Rita Dove shines through in both of these "chapters". By the time I got to her Pulitzer Prize winning love story -- "Thomas and Beulah" -- "set against the backdrop of war, industrialization, and the civil rights struggles," I was a "believer". My favorites are found throughout "Mother Love" -- identified here as the "exquisite reinvention of Greek myth" as told in sonnet format -- the "multifaceted gems" in "Grace Notes" and the "troubling rapids of recent history" in "On the Bus with Rosa Parks" finishing with a fine finesse in "American Smooth" -- an "homage to America's kaleidoscopic cultural heritage." All five (5) of these chapters or books were nothing short of enthralling, ground breaking and breath taking in scope, creativity and invention. Rita Dove tells it like it was to her and like it is to me -- damn straight there!! Spectacular, simply spectacular! Again, I risk being irreverent here but I daresay it reaffirms my thought that "I like my coffee like I like my women" and now like I like my choice in poets -- black, brown or tanned and with a whole lotta attitude! If it's so darned good, then why give it only four and one-half stars (4 1/2)? Probably because the earlier work was, well, not to put too fine a point on it, not that good and, at times, rather trying. In fact, the first two (2) "chapters" took me a long time to read because: a) I kept going back to make sure I truly did read what I just read; and/or b) frankly, I did not understand it when I read it and still don't. When poetry becomes too obtuse and difficult for me to read, it tends to turn me off completely, as when you mix A.A. Milne, Lewis Carroll, William S. Burroughs, Jim Morrison and Hunter S. Thompson you'll end up getting mind-blowing thoughts about what is essentially pure horse manure. But to say Rita Dove's earlier work is "all that and a bag of chips" would be harsh, insensitive and just plain wrong. She's a brilliant "wordsmythe" in her own right whom, I hope and trust, is just getting started here and has another thirty (30) years ahead of her. Rock on, Rita!Despite it's four and one-half (4 1/2) star rating, I am going to list this as among my "favorites" and as one of the best books read in 2017; well-deserving of its nomination to the National Book Award for Poetry in 2016. Now on to more of the 2016 NBA nominees! It's a GREAT reading life, my goodreads "homies" -- damn straight that! This book is a really nice collection of poems which I really enjoyed. All of my favourite Rita Dove poems are in here. She is a brilliant, earthy poet with a lot of messages woven into her beautiful and elegantly crafted poetry. This is a really great collection which I thoroughly enjoyed. 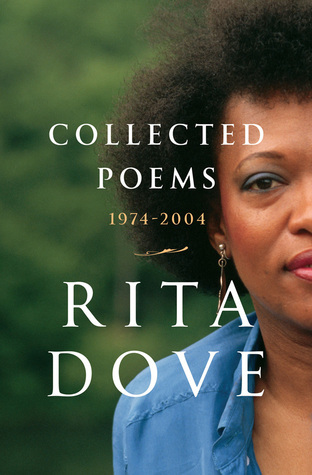 Rita Dove Collected Poems 1974-2004 is a treasure trove of Dove's work published between 1974 and 2004. The poems are a journey through Dove's life as well as the world. There are moments that transport the reader into the past to explore how the present came to be and leave the reader conjecturing what the future might bring. Dove's words remind the reader how interconnected the world in which we live is as well as how our differences have the power to either unite us or divide us. Dove explores love, family, politics, culture, history, and self-discovery among other topics in this diverse and yet cohesive collection of poems. I took my time reading these poems often taking a day or so to reflect on what I'd read. Dove's poetry is inspiring and honest in a way that made me think about life, writing, and my place in the world. Rita Dove is a great story-telling poet with a wide range of interests that make for an eclectic and entertaining collected works. I didn't connect with some of the earliest collections, but was glad I stuck with the book--beautiful, insightful writing. I think Rita Dove is a wonderful poet. I hadn't read her later works so this chronology was a grand find for me. highly recommended for anyone who likes poems that deal with art and life. Many of my favorite collections bundled together in one great book. Dove's poems blend the personal with the historical showing us pivotal moments, injustices endured with courage and intelligence, through the concrete examples from dusting, to cooking, to building zeppelins, to a company picnic to war on the other side of the ocean. Well crafted but what always grabs me by the throat in Dove's poem is the persona, speakers who take us inside the mind whose day to day being is constantly shaping and being shaped by history.